A Windows phone game, developed by Austrian Christian Zangl, has been blocked from release in China not because it contained contentious political commentary. It's been blocked because it featured the sound of a flushing toilet. According to Microsoft, that makes it offensive to the Chinese market, and "Content that is offensive in any country/region to which your application is targeted is not allowed." 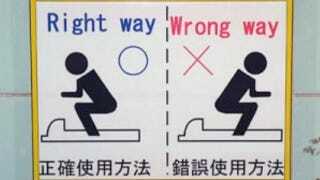 OK, so Chinese bathroom etiquette is a little different. You won't find toilet paper in many public bathroom stalls, for example. And you often find it's custom to put "soiled" paper in a garbage bin rather than flush it. But let's be real here: the Chinese dig toilet humour as much of the rest of us. Which Microsoft may have picked up on seeing as the game's available on the Chinese App Store and has a healthy 4-star rating.